I am back here again with some more baby cards for the Inky Paws Challenge #66 Baby theme. I purchased the Lovable Laundry stamp and Stitched onesie die set last year from Newton’s Nook, and it became one of my favourites since then. The images are super cute, so easy and fun to colour, the possibilities are endless. It makes the sweetest baby cards and the die adds some faux stitching which is adorable. For this week I wanted something really colourful and suitable for a new baby boy. I selected a couple of Doodlebug patterned paper and die cut them using a stitched collage die from MFT. I cut the same die also from coordinating coloured cardstock and paper pieced them on a white top folding card base. I stamped the sentiments in black ink on the blue panels on both cards. Then I stamped the onesies on Copic friendly cardstock and coloured them with Copics. After die cutting them I popped them up on the cards using extra layers of the onesie cut from white cardstock. It looks like chipboard in this way. On one of the cards I added some white fancy scalloped circles under the onesies for more contrast. It would not be a card from me without some Tonic Aqua Shimmer and glossy accents. I hope you got inspired and will participate in the Inky Paws Challenge #66. You have time until Friday (2nd March) to upload your projects on their website to be eligible to win a 20USD gift certificate to the Newton’s Nook Designs online store. Thanks for stopping by, hope you return soon. 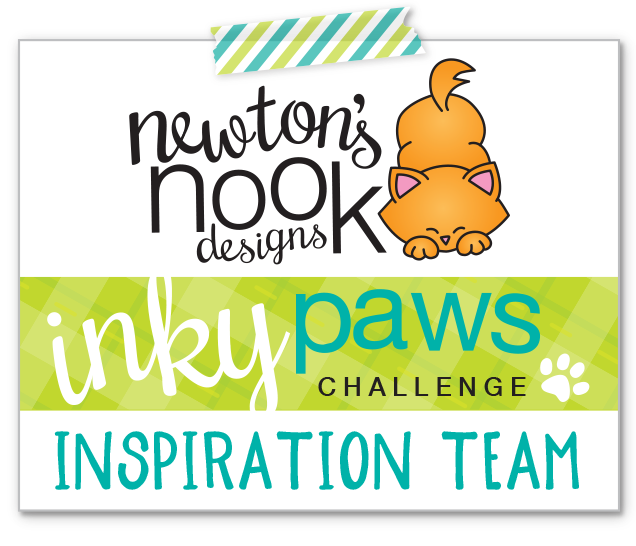 A new challenge is live on the Inky Paws Challenge site. The theme is Baby cards, such a fun thing to create. For my card today I wanted to challenge myself and use the latest Newton’s Nook Designs stamps I have. So I created a little cupcake family using images from Sending Hugs and Love bites. I coloured them with Copics and cut them out with the coordinating dies. Then I set the scene: I die cut a stitched heart from white cardstock, 2 stitched scalloped edges from green, a piece of Doodlebug patterned paper and some strips of purple cardstock. I assembled the card on a white card base ad popped up the little cupcake with 3D foam tape to put it in the spotlight. The sentiment is from Lovable Laundry, stamped in Lavender ink. I wanted to make it more playful, so I hand drew a face to the little cupcake to match the “parents” in style. I used a black glaze pen on the eyes and glossy accents on the hearts. I added a tiny amount of shimmer with my Tonic Aqua Shimmer pen to the cupcake holders. I hope you got inspired and you will play along with us at the Inky Paws Challenge Inky Paws Challenge this week. You have 2 weeks to link up your projects to be eligible for the 20USD gift certificate to the NND online store. See you soon with another fun card. Have a lovely day! I started with selecting the background paper. 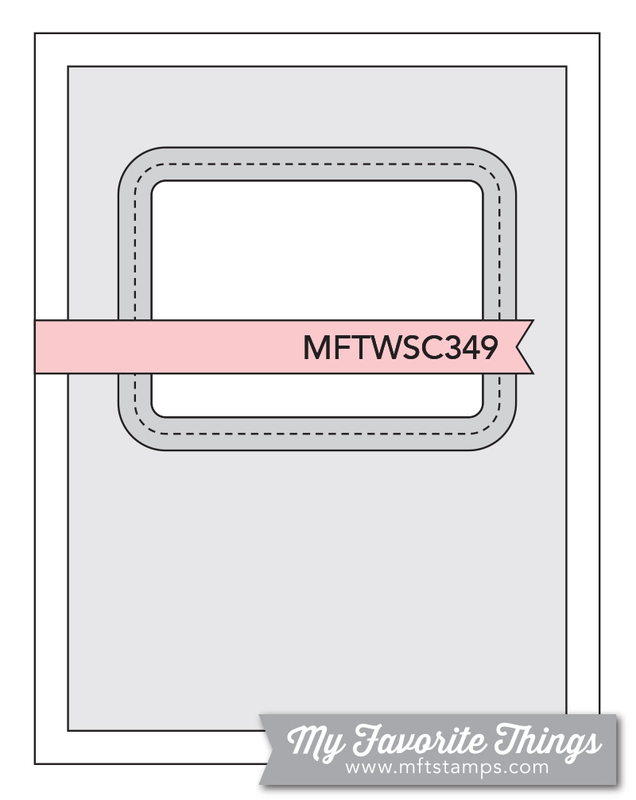 I wanted something playful but not very pink (I just made my brother and my sister-in-law a very pink card when we gave some clothes a day before the delivery – blog post later this week). I cut a stitched rectangle with Blueprints 15 and a matching blue stitched rectangle frame. I also cut another 3 frames from leftover packaging and stacked them together for dimension. I also cut a piece of white heavy weight vellum and adhered it to the back of the stacked frames. It muted the background pattern enough to make the little critters pop. I white heat embossed a sentiment from the MFT Essential sentiments set on a pink stitched banner and glued it flat to the bottom of the frame. The cute little images are from the Up in the air stamp set, stamped in black and coloured with Copics. I used the coordinating dies to cut them out and adhered them to the frame using 3D foam tape. I gave a light grey mat to the whole panel and mounted it on a white top folding card base. A bit of Spectrum Noir shimmer pen on the heart garland, glossy accent on the noses and a black glaze pen on the eyes finished it off. I will link this up on the MFT Sketch Challenge #349 and the Simon Says Stamp Wednesday Challenge Stamp it. I hope you like this cute welcome baby card and will return for more inspiration soon.